This review was first published in the Jan. 5 edition of The Hamilton Spectator. Please raise your right hand and repeat after Loretta Malandro. Let’s make 2015 the year that we start talking to people and stop talking about them behind their backs and trashing them on social media. 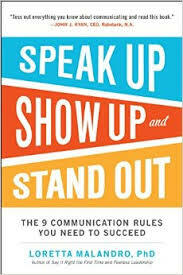 “This communication rule, talk to people and not about people, is a doozy,” says Malandro, who’s the author of Speak Up, Show Up and Stand Out, a behavioral expert and founder and CEO of an international consulting firm. It’s not enough to quit our kvetching. We also need to stand up to toxic co-workers who conspire behind closed doors, split our workplaces into warring factions and disparage our organizations. So how do we break our silence and confront habitually negative malcontents who could redirect some of their bottomless ire our way? Remind the people you work with about your personal pledge to not engage in negative conversations. Your approach is to talk to people, not about them. You stand for the success of everyone. This is your rule and it’s not up for debate. If you can’t change the conversation, respectfully end it. Thank your co-worker for her opinion, say that you have nothing to add and then stop talking. Creating positive partnerships and stopping negative talk is one of Malandro’s nine communications rules for improving our ability to influence others and make change happen. While her rules are common sense, Malandro says they’re not normal behaviors. So here’s to talking to, rather than talking about, people in 2015.